And so begins the story of one of the most beloved characters in children's literature, Peter Pan. 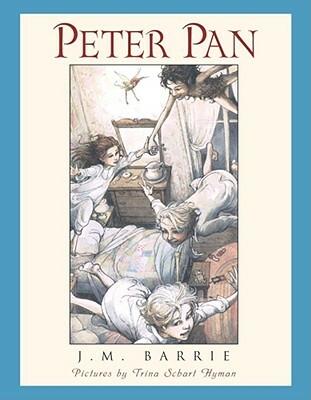 J. M. Barrie's classic tale, completely unabridged, features a boy who refuses to grow up, Tinker Bell the fairy, and the Darling children -- Wendy, John, and Michael. Their great adventure begins on the night that Peter flies into the Darling home looking for his shadow and teaches Wendy, John, and Michael how to fly with him back to the Neverland, where adventures happen every day. Caldecott winner Trina Schart Hyman's illustrations are as mischievous, ethereal, and playful as Peter Pan himself, making them an ideal compliment to the Scribner Illustrated Classic line.